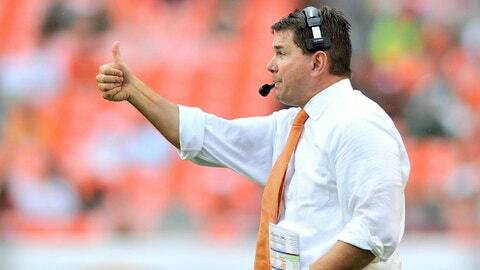 Head coach Al Golden hagone 22-15 in three seasons at the University of Miami. Golden reiterated on Monday that he is not the candidate for a job elsewhere. CORAL GABLES, Fla. — University of Miami head coach Al Golden didn’t mention Penn State by name once during Monday afternoon’s press conference. Though he fielded questions regarding last week’s speculation he would take the vacant position at his alma mater, Golden emphasized his readiness to move forward as a Hurricane. "It’s one of those things, I really don’t talk about other programs or other universities," Golden said. "I think it’s important we talk about the University of Miami and the direction we’re going. "Obviously there’s some universities that have expressed interest the last couple of years, and I’ve never addressed them, any of them, and I’m not going to start doing that now. I plan to be at the University of Miami." Golden, who said he was in the office both Thursday and Friday evaluating the Hurricanes, released Sunday’s statement reaffirming his commitment when told by the athletic director and others about the widespread speculation. With the dead period in recruiting about to end, Golden is excited to get back on the road. The class currently ranks in the top 10. Returning student-athletes start the spring semester next Monday. "It’s humbling and it’s been flattering, and it’s a testament to our staff and student-athletes that other people express interest in us," Golden said. "Like I said yesterday, I’m excited about where we’re going at the University of Miami." Despite calls from some in the fan base to fire defensive coordinator Mark D’Onofrio, Golden said there would be no changes in the coaching staff. After evaluating the team Monday, Tuesday, Thursday and Friday of last week, Golden arrived at a decision Sunday. Last offseason, three offensive positions, including coordinator, needed replacements. Golden looks forward to the returning staff and players. "The answer right now is not change, the answer is continuity — it’s progress with our young people and continued development," Golden said. "It’s my decision, and my decision was that starting over for these young people was not the answer. Continuity, continued progress, continuing with the same position coaches and techniques and schemes was the better answer for me. I made that decision after careful evaluation." With the departure of Stephen Morris, who started the past two seasons, a quarterback battle will be on display this spring. The presumed frontrunner appears to be junior Ryan Williams, Morris’ backup this year. His competition would include freshman Kevin Olsen, redshirt freshman Gray Crow and any incoming recruits. "I think Ryan has done a really good job, but you’re not anointed the starting quarterback anywhere," Golden said. "Ryan did a great job distinguishing himself as the No. 2 in training camp." "Ryan’s growth, development, his maturity, his football intelligence, the relationship with Stephen and the progress that he madeâ¦ obviously he’s someone we’re excited about." Golden doesn’t foresee any players leaving as he expects the same roster heading into spring football. In fact, eight early enrollees plan to arrive on campus soon: wide receiver Braxton Berrios, offensive linemen Trevor Darling and Kc McDermott, defensive tackle Calvin Heurtelou, defensive end Trent Harris, linebacker Juwon Young and running backs Joseph Yearby and Brandon Powell. Golden addressed the absence of Olsen, freshman defensive back Ray Lewis III and junior wide receiver Rashawn Scott at the Russell Athletic Bowl. All three of them were suspended for detrimental conduct (violation of team rules). "As (Rashawn) gets into his senior year now he’s going to have to be a guy that speaks for himself," Golden said. "As I said that about Seantrel (Henderson) this year. It gets to the point where they’ve got to be accountable for their teammates and family and themselves. "We really like both of those young men (Olsen and Lewis). All of them have moved forward and are excited to come back, and we’re excited to work with them."